writers, actors technicians had participated with their self inventions to change the industry and the credit should also goes for Bharat Gopi who with his own style of acting, prepared a way for cinema lovers to think differently. 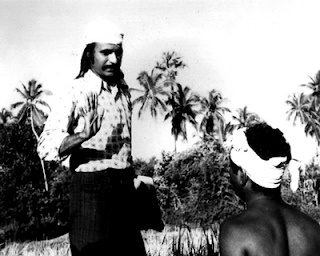 In 1981, With his "Yavanika", Bharath Gopi became the part of critics and applauds. With his body language he had portrayed the Tabla player, Ayyappan in the movie. He mesmerizes every one with his disposition and love in "Yavanika". Whether it is art or commercialization, he changed every bit of definition when he turned his path towards realistic films. During his career, health problems have derailed his wishes to do more for films and the paralytic attack led him to serve months in a bed. After the paralytic attack, he got the roles which he can enact with his body. "Padheyam", "Agnidevan", "Susanna", "Ormakkalundayirikanam", "Vasanthiyum Lakhsmiyoom Pinne Njanum" are the few films. He had also directed some films also but all went in vein. Later in 2000, acted in movies like "Sethurama Iyer CBI", "Rasathanthram", "Nivedyam", "Nasrani", "Akasha Gopuram", "De Ingottu Nokiye" are the few. With his style to set the emotional scenes had gifted new methods for emerging filmmakers, Bharat Gopi was an extraordinary actor with his extraordinary talent. His view was - 'When the actor himself turned the character then acting will definitely find success'. This legendary persona's disposition skills had presented Indian cinema with many glorious moments. Bharath Gopi the name will always be remembered as a big star of Indian Cinema. Updated - Jan.28, 2018 Published - March 8, 2010.